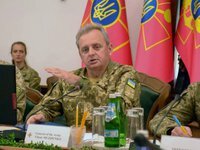 Chief of the General Staff of the Ukrainian Armed Forces Viktor Muzhenko has said that he will visit the United States in October to hold a number of bilateral meetings and take part in a security conference. "Next month I'm planning to visit the United States, where I will have a meeting with the chairman of the Joint Chiefs of Staff and a number of bilateral meetings. I will also attend a security conference for NATO countries and partners, which will address the issues of responding to terrorist threats," he said in an exclusive interview with Interfax-Ukraine. Muzhenko also noted that the U.S. side has satisfied the request of Ukrainian colleagues and promised to familiarize them with the work of the United States Joint Forces Command. "We are also going to visit a number of military bases of the California National Guard. By the way, the national guardsmen of California have more than 20 years of experience of partnership with the Ukrainian Armed Forces," he said.